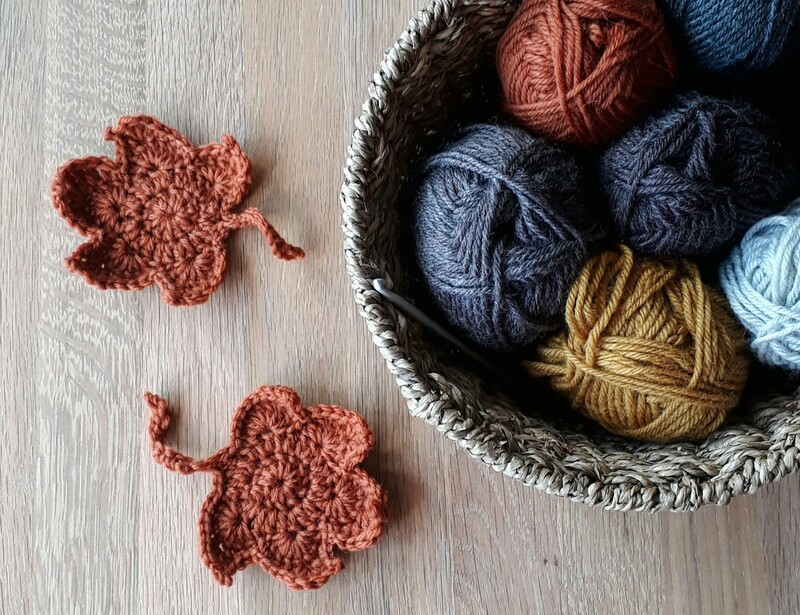 I like to crochet a lot at the best of times, but autumn always makes me want to crochet more. It's the thought of all those scarves and cowls, wrist warmers and bobble hats. So tempting. I recently made a maple leaf garland for a friend and colleague who teaches in Maple Class. It was such a nice project; enough detail to hold my attention, but not too tricky, short enough that is only took a week or so but still pleasing to see those leaves pile up in their gorgeous, rich colours. It was also a good excuse to use up the large amount of Drops Karisma yarn I have left over from crocheting various animals and birds. The pattern (from here) really stood out when they were blocked, and then I just attached each leaf to a length of crochet chain stitch. I've also been making pumpkins. You will probably know by now that I don't, for various reasons, really go in for Halloween, but I do go in for autumn in a Big Way, and pumpkins say autumn to me so much. The pattern for these is from the book I used for the crocheted fruit and vegetables but you can easily find many free patterns on Ravelry. These were a delight to make and another great way to use up a lot of leftover yarn I had in various colours and weights. You essentially crochet a sphere shape, then use long stitches to create the segments. The moment when the ball of yarn turns into a vegetable is really fun - well, to me, anyway. I love these colours. All leftovers but my kinds of colours, and they work well together. Totally out of the blue, Bella requested I make her a pair of wrist warmers. I nearly had to sit down because Bella never wants me to make her anything to wear, mainly because of how embarrassing I am, but also because she finds wool (even acrylic blends and the softest, most expensive baby cashmerino) unbearably itchy against her skin. So when she asked for some blue and white wrist warmers, I was on it straight away. Anticipating that these might not ever get worn, I kept it simple, using Lucy's pattern as a starting point, and crocheting two squares which I then stitched up the sides, leaving a gap for a thumb hole. She likes them, and finds the wool is OK on her hands and wrists, where perhaps the skin isn't as sensitive as her neck, and was very happy to model them for me on the proviso that she could drink the hot chocolate afterwards. Next on my list is a rabbit, again for school, and then a cowl for myself. I have my eye on this pattern and have just the right amount of leftover cashmerino DK in grey, black, blush pink and mustard, and I'm looking forward to starting it. I don't need another cowl, but it'll go really well with my new black leather biker jacket which I didn't need either, but I'm forty next birthday, so I feel it's important to start the mid-life crisis in plenty of time. I realise that I've given away a lot of my crochet lately; a baby blanket, the box of fruit, the maple leaf garland, Bella's wrist warmers, and then back in the summer an owl and the box of vegetables. I don't mind this at all. So long as I'm crocheting what I want when I want (which is so different to the simmering resentment that comes from making something that you don't really want to make, that your heart just isn't in, for someone because you didn't want to say no...) then I'm happy. I feel like our house might be at Peak Crochet sometimes. I mean, do we really want or need any more crochet cushions or blankets? At the moment, I find that it's a pleasure to enjoy the process of crochet and then give it away to someone who will continue to enjoy it more still. Until I see a pattern that I absolutely have to make, of course, and then I'll be straight down to my local yarn shop. What about any other fellow crafters, do you give away much of what you make? I think it's nice to give away your work. I try to do that, but I don't have many people in my life who care to have it, and have even had some people refuse to take it, which seemed rude to me. I would be happy to give it away if I thought it were appreciated, though. You made some really nice things. Your pumpkins are adorable, I love their long stems! Oh no, I agree refusing to take a gift sounds a bit rude. You've made some lovely things Jennifer. You inspired me to make the Chevron Scarf which I crochet whilst the teens go swimming. Sometimes people don't want things because they don't like them - it's rude to insist I think. Why should we expect people to like things because we do or because we made them? I think there can be quite a lot of passive aggression involved with 'giving' sometimes. Other people might find it awkward to accept because being given things embarrasses them, sometimes they do want them but feel unable to accept, other times they just don't want them. People do make some rather ugly things sometimes as well, which the maker should keep, and not create clutter for others. I also know people who like things but don't need to have them. My daughter loves and wears her mittens all the time but will only have them replaced when they fall off her hands, as she doesn't like to have more than she needs. Why don't people just ask what people might like? It may not be a surprise but it saves disappointment on both sides and wasted effort too. Then an item can be eagerly anticipated and joyfully received, instead of with a sense of impending doom when they get the tale tale squishy parcel. The reward being a genuine smile of appreciation. I like giving things away too, but sometimes the pleasure is just making things & keeping our hands and minds active in a relaxing way, instead of the things we have to do. I love your mini pumpkins & all your makes are very autumnal. Glad Bella is enjoying here hand warmers. Take care. Love the pumpkins and the leaves, beautiful. I've never really thought much about the wrist warmers to be honest but I loved your ones. I think their simplicity is what makes them so stylish. I too do not celebrate Halloween at all. What delightful pumpkins! I mostly knit and sew for my three little boys, and occasionally myself or my husband. I enjoy wrapping my loved ones up in hand made love! I don't do any type of crafting, but my Mum is a busy knitter! She makes socks, wristwarmers, beanies, scarves... you name it, she makes it :-) And while she does sell some on Etsy (the link to her shop is on my blog), she also gives away a lot. Everybody loves her socks, and I have several woolly hats and scarves made by her. I am getting to the point where, as much as I love to crochet, I can’t fit anymore in my house. I do, however, have about 4 more blankets in my head that have been on my make list forever and WILL, at some point be made! I’ve done as much as I think my family can take of makes to give away, and I’m getting fussy these days of making decorative crochet items for my home (I’m trying so hard to streamline more!). I guess small makes, like you, are scarves, wrist warmers, hats etc and Autumn is the perfect time of year to get excited about them. I have a gazillion of them, but find I love making new pieces for new outfits. I’ve made 3 shawls, just finished a pair of wristwarmers and have just cast on a new scarf in some delicious yarn with a newly learned stitch. I am in love! Like you, I don’t do Halloween. It’s more an American thing and it’s just so half hearted here. Just a big push in shops and is a waste of money. Plus, I loathe the pumpkin orange so much, I refuse to have it in my house! The youngest has requested to carve a pumpkin so I might have to give in, but it’s staying outside in the garden! I’m a meany! Your garland looks lovely. I’ve just started an Autumn wreath, but no crochet for this project. Lots of colourful felt though. Your pumpkins inspired me on my own pumpkiny journey and I'm having a huge amount of fun....they are so addictive mind you. I might make some to give away, don't want to reach Peak Pumpkin!!! Beautiful hand warmers and a drink of hot chocolate, you are all set for winter. I am all about making and giving away. If the recipient does not like it or use it it matters not to me, I know that sounds harsh and I don't mean it to. I make something with love and send it away with love. IF it is loved or donated it still has been made by my hands with good intentions. I love your pumpkins.